The following article was published on the Newcastle Herald on May 19th, 2018. “Newcastle-based charity ship – s/v Ruach – will return from its stint in Papua New Guinea next month hoping to garner the support of the Hunter ahead of its second voyage later this year. The Ruach, which was docked at Queens Wharf last year before leaving for PNG in October, is run by YWAM Ships – a Christian charity working with the PNG Government to achieve health and training outcomes. Their work is aligned to the PNG Government’s national strategic plan, “Vision 2050”, which aims to make “Papua New Guinea become a smart, wise, fair, healthy and happy society by 2050”. YWAM has been working in PNG for eight years, but Newcastle’s ship is on a maiden nine-month voyage. 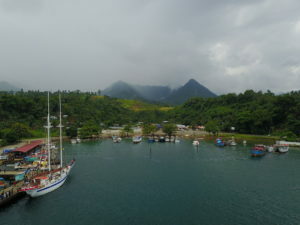 Based in the Milne Bay Province, an area of over 600 islands, the Ruach is working with the Milne Bay Provincial Health Authority to deliver services in primary health care, dentistry, optometry, and vaccination, as well as training locals in ship roles. Delivering basic services in PNG poses huge challenges, as over 80 per cent of the population lives in remote and rural areas. The link between limited educational opportunities, unemployment and lawlessness makes educating PNG natives a crucial part of YWAM’s work. “There are about eight, possibly nine million people in Papua New Guinea and there is critical health needs, absolutely critical,” Mike Reynolds, YWAM Ships’ Australian patron told the Newcastle Herald. YWAM, working with the PNG government, hopes to see such statistics improve in the next few years. Much of the work done on the maiden voyage has focused on building links for future trips, but they may not be possible without support. The annual operating cost of the s/v Rauch’s minimum eight-month stay in PNG is about $350,000. Mr Reynolds believes the historic link between Australia and PNG is a bond that should ensure community interest in the ship. “We work very much more from a bottom-up approach,” he said. “Because of the nature of the demography of PNG, it does necessitate us working very strongly with the provincial health authorities, down to the local government level, and also to villages and islands. The Ruach departs Alotau, the capital of Milne Bay Province, in early June. After a stop in Townsville, it will arrive in Newcastle around June 30. Read the online article on the Herald website.